Owners of e-commerce businesses are constantly hunting for ways to improve the performance of their sites. One of the most common analytical measures is the bounce rate. However, as helpful as this stat can be, it can also lead you astray. A few variables mix with the bounce rate and it does not stand alone as a barometer of success. As with any piece of information, it is just a piece of the puzzle, not the entire picture. A bounce is defined as when a visitor lands on your site and does not click through to a second page. The bounce rate calculation is the number of visitors that only record one hit (i.e. landing on a page) divided by the total number of hits—or entries—to the page. In theory, this raw data can then be used to evaluate the effectiveness of the site. But, take a breath, because this can sometimes be very misleading. The bounce rate metric is meant to measure engagement and visitor behavior; yet it does not include visitor expectations. In other words, bounce rate analysis can be highly subjective. 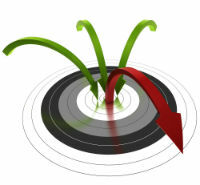 What Is an Ideal Bounce Rate? Whether you have a professionally designed website or used a free website maker yourself, many e-commerce business owners want to know if their site is effective and what a good bounce rate is. Well, that depends—and that’s not a cop-out answer, either! Logic tells us that a lower rate would be best. An average bounce rate is about 50 percent, but that may be a very good or very poor percentage, depending on visitor expectations. One of the main drivers of those expectations is the industry in which your business operates. An ideal bounce rate is industry dependent. Some industries naturally generate a high number of new visitors to sites, and are therefore likely to have higher bounce rates, while others are prone to more repeated visitor traffic. Factoring in your particular industry certainly helps to put the bounce rate into context. Some business are simply going to have high bounce rates. For example, rental and parts businesses have high percentages of new visitors as well as high bounce rates. If a customer wants to rent a car, they are likely just visiting the site to find the rate, which will be easy to locate. Then they will immediately move on to a competitor to continue their research. Financing and sales also have very high new visitor rates; however, their bounce rates are significantly lower than the 50 percent average. Customers need more information than they can get on one page, which means they need to click around to find details before deciding to either buy or move on. Loyalty as a customer behavior can also be a factor. Branded sites have very low new visitor rates and even lower bounce rates. Visitors loyal to a particular brand usually stick around longer and dive deeper into the site to see if there is anything new since they last visited. How Can Bounce Rate Be Improved? There are ways to improve the bounce rate within an industry. Not surprisingly, site content is vital. If visitors are expected to click deeper than the landing page, there must be content there that will appeal to them. One method is to communicate with the visitors as opposed to simply presenting them information. Storytelling as a strategy can bolster content effectiveness and help lower bounce rate. Incorporating a strong social media campaign to support the content can also work to position the bounce rate on the lower side of the industry standard. For your e-commerce site, the important takeaway is to not get too focused on bounce rate because it’s not an independent factor. As with any customer behavior metric, bounce rate is most effective as a tool when it is compared to other competitors in the same industry with the same customer expectations. Learn how to build an engaging website that keeps visitors from bouncing with a free website maker .